Okutama is a mountainous region in Nishitama District located along the Tama River, which is at the western most end of Tokyo and forms a part of the Chichibu-Tama-Kai National Park. It offers various trails with gorgeous scenery and beautiful autumn scene. 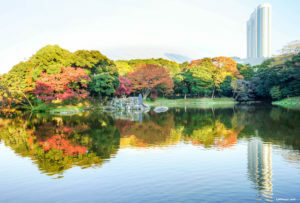 Shinjuku Gyoen (新宿御苑) is one of the largest park in Tokyo. It provides a relaxing and tranquil atmosphere which makes it a popular destination in the city. The park’s various landscapes also provides stunning autumn hues. 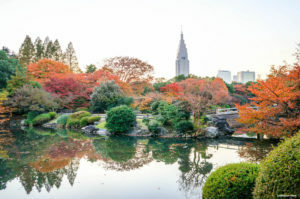 Koishikawa Kōrakuen (小石川後楽園) is one of the oldest and best preserved parks in Tokyo and one of the surviving gardens from the Edo period. Numerous maple and ginkgo trees are planted along walking trails that lead to ponds, bridges, and man-made hills, providing one of the most pleasing autumn viewing spot in the city. 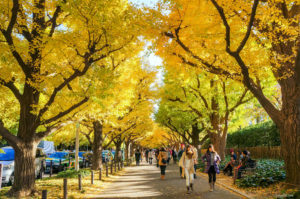 The Ginkgo Avenue located in Meiji-jingu Gaien Park is most popular during the autumn season – when its 300 meters long ginkgo tree-lined boulevard turns to radiant yellow creating a brilliant landscape. 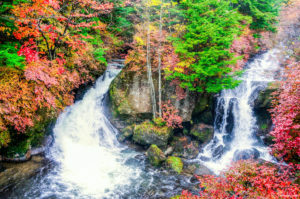 Oku-Nikko forms a part of the Nikko National Park and offers a scenic beauty of the mountain landscapes, marshes and lakes, waterfalls, hot springs, wild monkeys, and hiking trails. 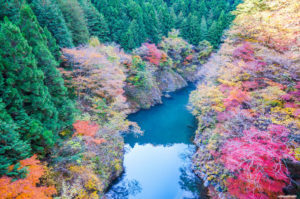 The Oku-Nikko area is also well-known for its beautiful autumn colors and provides an excellent walk with nature.